Sweet Jojo Designs Children's Musical Mobile are especially created to coordinate with their nursery bedding sets to complete the look and feel of the bedroom theme for your child. 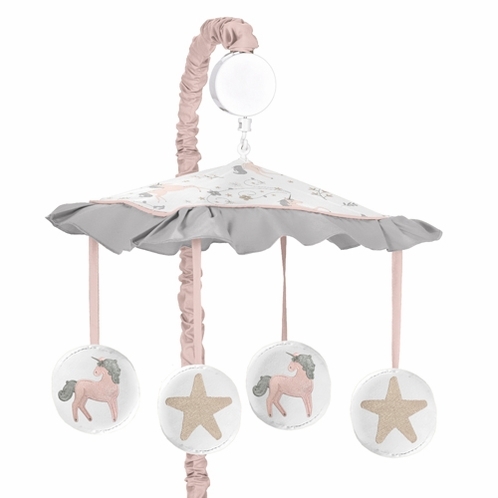 Lull your little one to sleep in style with this beautiful mobile that plays Brahms Lullaby (Cradle Song). If you are not pleased with your purchase for any reason, simply call us M-F between 9a.m. and 5p.m. Eastern time at 1-866-999-6255 to request return instructions, and ship it back to us within 14 days of receipt for a full refund of your purchase price (this does not include your original shipping and handling fees). We must receive your returned purchase within 14 days of receipt in order to issue a refund. After we have received your return, inspected it, and approved it for a refund, we will credit the approved refund amount to the credit card or PayPal account used to purchase the returned item excluding shipping and handling charges. We do not accept returned items that have been used. Used condition includes but is not limited to: item is washed, item is stained, item has hair, lint, or fuzz on it, item smells of smoke or other odor, etc. Items returned in used condition cannot be restocked and are therefore subject to a 50% restocking fee. Items returned must be in their original condition and packaging. If the items are not in the original packaging, but are able to be restocked, you may be subject to up to a 20% restocking fee.